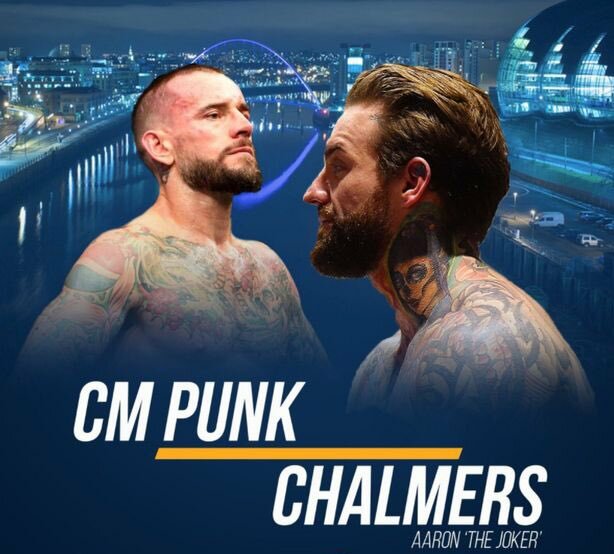 That was the message posted by Aaron Chalmers formerly of Geordie Shore (for any American's that's basically the British version of Jersey Shore lol). Accompanied by a mock up promotional photo of the two of them. Chalmers is currently in the process of signing with Bellator but unable to fight due to a contract dispute with his former employers BAMMA. So if the fight were to come to fruition it would mean Punk returning to MMA under the Bellator banner. Do you think Punk comes back for another fight? No - not against him anyway. Chalmers has fought four times professionally. Combined records of his opponents is 4 and 10 and only one of them has ANY WINS. He hasn't gone past the first round in any of them. He would KO Punk in less than a minute. I would not call this a 'challenge' but it doesn't seem as though he wants to 'challenge' himself anyway.